After finishing my kitchen remodel I craved home food, and especially this carrot-ginger soup. I think part of the allure was that lack of a stove didn't allow for recipes where "simmering" was an option but also because the vibrant flavor is just so addictive. There are a number of ways to tailor this soup to make it your own but here's the base. The rest is up to you! Heat olive oil and add the onion, carrots and celery. When soft, add the red pepper, garlic and ginger. Pour in the broth. Add the potato and scallion. Simmer 20 minutes or until all vegetables are tender. How to tell if a potato is cooked? According to a good friend from Moscow who claims she KNOWS potatoes, if you stick a knife into one, pull it up out of the broth and it easily slips off the knife, you know it's done. I've tried it, it works. Run a stick blender through the veggies and broth until smooth. Add cream, salt / pepper to taste and honey if you want your soup a bit sweeter. For me, I like soup with a bit of a bite so I add a few shakes of tabasco and lemon juice to taste. 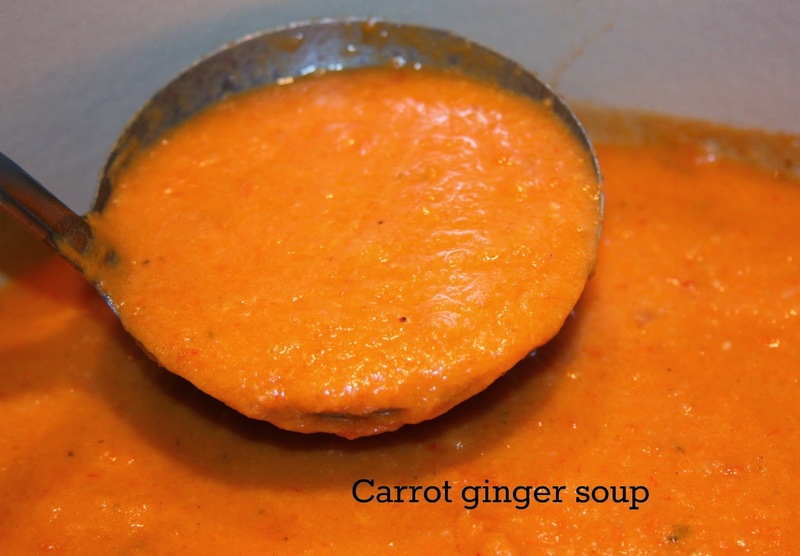 The lemon cuts the sweetness of the carrots and gives the soup a slight hint of tang. Yummy. Finally, if your soup is too thick add a bit more broth or water. Enjoy!